Santa Open Mike and general merriment after screening til closing. Free admission. Santa attire encouraged. 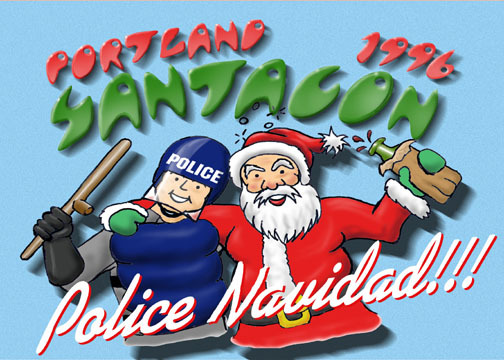 The event will also serve as a post-Santacon 2006 event for Bay Area Santas and we would especially like the 1996 Portland alumni to join us and tell war stories and show off their scars. If you’ve ever seen a mob of hundred’s of surly, inebriated Santa’s swarming around the shopping and drinking districts in your city & wondered what they were all about, this film will explain it all. 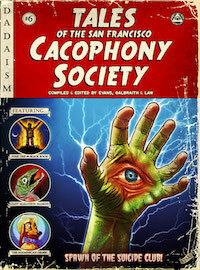 The SF Cacophony Society kicked off the Santa phenomenon in 1994. By 96 it was out of control. This film by Scott Beale is a document of the biggest, reddest and most outrageous of all the Santarchy events from the world-over since this silly traditions inception twelve years ago. Watch as 50 Santa’s board a jet for Portland, spreading X-rated X-mas cheer through the friendly skies! Marvel at how much Santa can drink and still manage a hundred Santa conga-line! Come and see 200 Santa’s in a cheery standoff with riot police in body armor!! Here’s a review of the documentary written by Jack Boulware for the SF Weekly. Oh and here’s the Portland Police Memo that was sent out to warn the citizens of Portland about the impending invasion. UPDATE: Here are some photos from the Santacon Party.